How to sum in Excel. 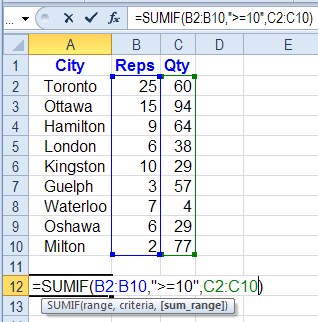 7 ways to sum in Excel. 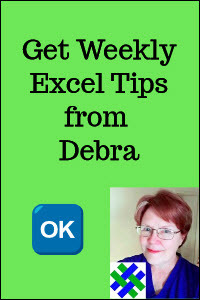 Watch short step-by-step videos, get written notes, download free Excel workbook with examples. 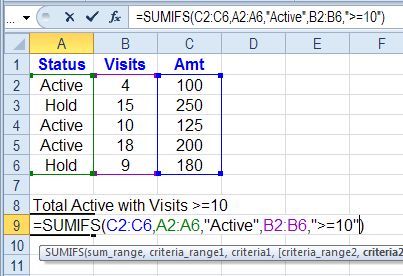 To see a quick overview of 7 ways to sum in Excel, you can watch this short slide show, or see the steps in the video. Download the 7 Ways to Sum sample workbook, so you can follow along with the video. The zipped file is in xlsx format, and does not contain any macros. The quickest way to sum a range of cells is to use the AutoSum button. It automatically enters a SUM function in the selected cell. 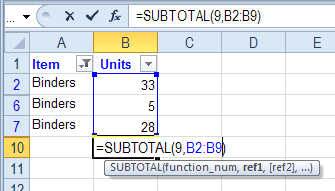 The SUM function totals one or more numbers in a range of cells. Select the blank cell in the row below the cells that you want to sum, cell A5 in this example. NOTE: If all cells are not automatically included, you can extend the frame, to select them. Press the Enter key to complete the entry. Instead of using the AutoSum command to insert the SUM function, you can type the function manually. The SUM function setup (syntax) is: SUM(number1, [number2],...). It also has optional arguments (enclosed in square brackets): [number2],.. These arguments can be cell references, or can be typed into the formula. In the example above (=SUM(A1:A4)), there is one argument -- a reference to cells A1:A4. In one quick step, you can calculate the row, column, and grand totals for a range of cell. Watch this short Excel Grand Totals video, to see how to do it. There are written instructions below the video. Click the AutoSum button on the Ribbon's Home tab. 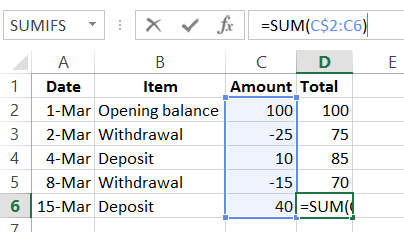 A SUM formula will be automatically entered for each Total. To see a running total in each row of an Excel table, you can use the SUM function, with the starting row locked as an absolute reference. Watch this video to see how to set up the formulas, and lock the starting row. The written instructions are below the video. Note: To see the video transcript, go to the Running Total Video page. Instead of calculating a total at the bottom of a range of cells, you can use a formula to show the running total in each row. 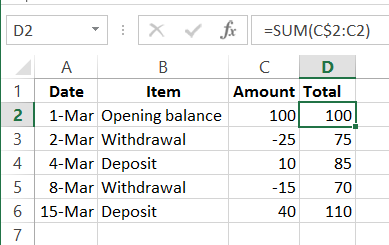 In the screen shot below, amounts are entered in column C, and a running total is calculated in column D.
If you insert a row directly above the SUM function in the previous example, the new row may not be included in the SUM. It may continue to sum cells A1:A4, and ignore A5. 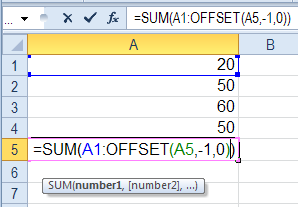 To ensure that new rows are included in the total, you can use the OFFSET function with the SUM function. 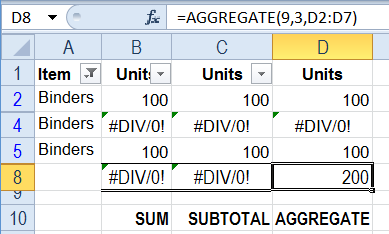 You can calculate a total for rows that meet a specific criterion. 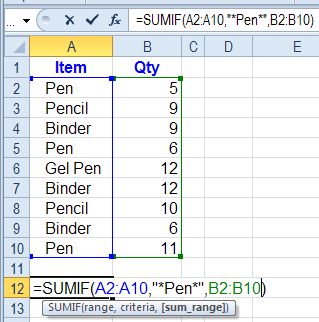 In this example only the rows with Pen orders will be included in the total. Type the criterion. In this example, you're checking for text, so type the word in double quotes: "Pen"
if cell B12 contained the text  pen. You can add cells that contain a criterion as part of the cell's contents. In this example all Pen, Gel Pen, and Pencil orders will be summed, because they contain the string "pen". Type the criterion. In this example, you're checking for text, so type the word in double quotes, with one or more asterisk (*) wildcard characters: "*Pen*"
The result will be 53, the total of rows that contain the string, "Pen"
You can use an operator with a criterion. In the examples below, see how to combine them in the SUMIF formula. In this example only the rows where the number of sales reps is greater than or equal to ten will be included in the total. Type the criterion. In this example, you're checking for rows where the number of visits is greater than or equal to 10. The >= operator is used before the number, and the entire criterion is enclosed in double quotes. The result will be 183, the total of rows with ten or more sales reps.
if cell B12 contained the number  10. 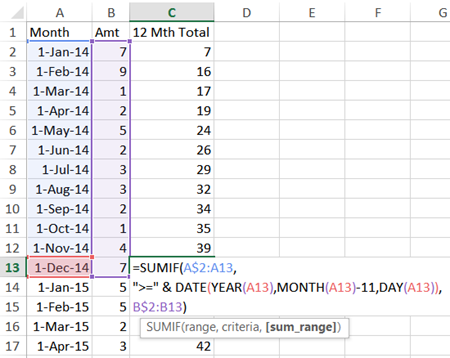 In this example only the rows for the previous 11 months, and the current month, will be included in the total. This creates a Rolling Total. The dates are in column A, and the list must be sorted by date. The monthly amounts are in column B. Copy the formula down to the last row with data. 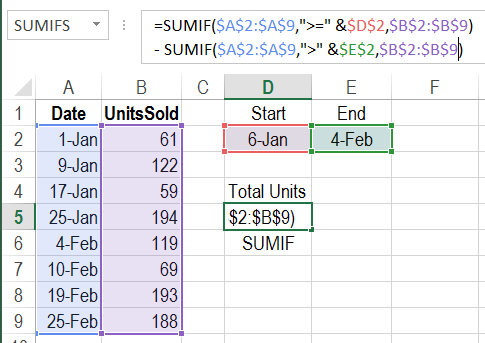 In Excel 2007 and later versions, you can use the SUMIFS function to calculate a total for rows that meet two or more criteria. Watch this short video to see the steps. There are written instructions below the video. In this example only the rows where the status is "Active" and the number of visits is greater than or equal to ten will be included in the total. A step by step video is below the written instructions. Type a comma, and then type the first criterion, "Active"
Type a comma, and then type the second criterion: " >=10"
The two categories are entered in cells G6:G7 on the worksheet. To calculate the total, we'll wrap the SUMIFS formula with a SUM function, and enter the formula as an array. Press the Ctrl + Shift + Enter keys to array-enter the formula -- the result will not be correct if you simply press the Enter key. Curly brackets will be automatically added at the beginning and end of the formula, to show that it is array-entered. Do not type this brackets yourself. 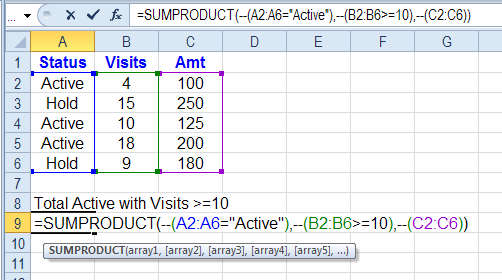 In Excel 2003 and earlier, you can use the SUMPRODUCT function to calculate a total for rows that meet two or more criteria. 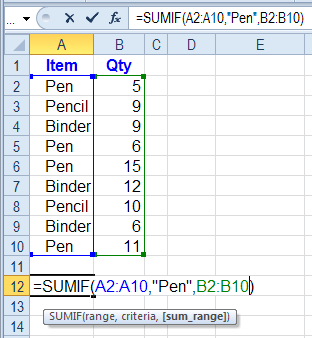 If you're using Excel 2007 or later, you should use the SUMIFS function, as described in the previous section. Type the first criterion: ="Active"
Use the SUM function and LARGE functions together, to add the largest numbers in the list. Note: The second 50 is not included in the result, even though it is tied for 3rd place. If many top numbers are to be summed you can include the INDIRECT function in the formula with the SUM function. In the INDIRECT function, use row numbers that represent the numbers you want to include. In this example, rows 1:10 are used, so the top 10 numbers in the referenced range will be summed. 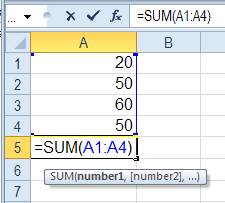 If a variable number of top numbers are to be summed you can include the INDIRECT function in the formula with the SUM function, as shown above, and refer to a cell that holds the variable..
To sum amounts based on a date range, you can use the SUMIFS function in Excel 2007 or later versions. Watch this video to see the steps, and the written instructions are below the video. In this example, a Start date and an End date are entered on the worksheet. 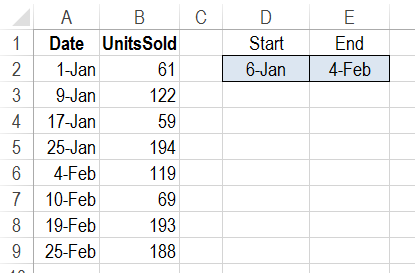 Dates are in column A, and units sold are in column B.
on or before the End date. The first argument, $B$2:$B$9, is the range with the numbers that we want to sum. The 2nd argument, $A$2:$A$9, is the range to check for criteria 1. The 4th argument, $A$2:$A$9, is the range to check for criteria 2. 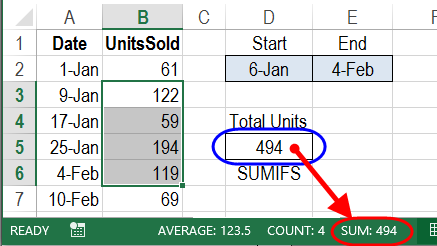 In this example, the result for the selected date range is a total of 494 units sold. To verify, you can select cells B3:B6, and look at the total shown in Excel's Status Bar. 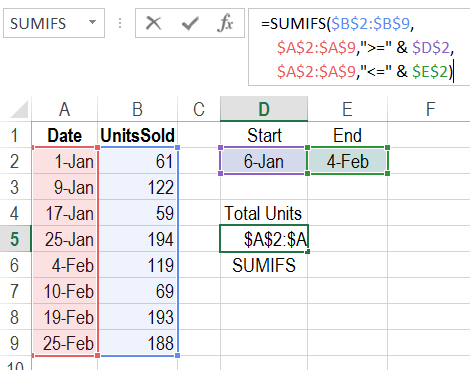 To get the total units for a different date range, change the Start date in cell D2, and/or the End date in cell E2. The range, $A$2:$A$9, contains the numbers that we want to sum. 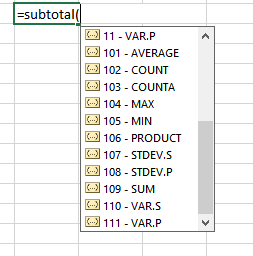 After you filter the rows in a list, you can use the SUBTOTAL function, instead of the SUM function, to sum the numbers in the visible rows. Filter at least one of the columns in the table. In this example, the first column has been filtered for Binders. Select the cell immediately below the column you want to sum. Click the AutoSum button on the Ribbon's Home tab. 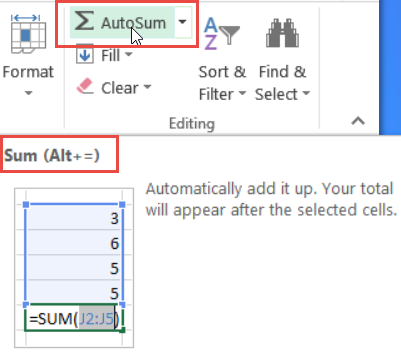 If you want the SUBTOTAL function in a cell other than the one directly below the filtered list, you can type the formula, instead of using the AutoSum button. The first argument in the SUBTOTAL function is a function number, that specifies how the numbers should be calculated. 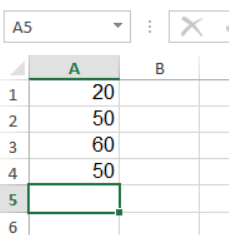 There is a 9 in this example, which tells Excel to SUM the numbers. 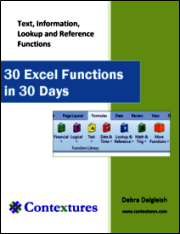 Other function numbers can be used, such as 1 for AVERAGE, and 3 for COUNTA. The full list is shown in my blog post Total a Filtered List. Press the Enter key to complete the formula entry. 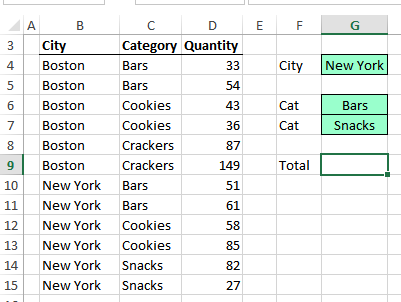 to subtotal visible cells in a range where rows have been manually hidden, or filtered. The first argument in the SUBTOTAL function is a function number, that specifies how the numbers should be calculated. There are 11 functions that you can use as the first argument in the SUBTOTAL function. The list is alphabetical, so that might help you remember some of the numbers, without going to Excel's Help every time. The functions are each listed twice. The first group of functions is numbered 1-11. The functions are each listed twice. The second group of functions is numbered 101-111. 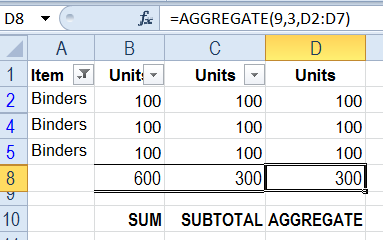 The AGGREGATE function, introduced in Excel 2010, is similar to the SUBTOTAL function, but it has more functions, and can ignore error values, as well as hidden rows in the data. Watch this video to see the steps for setting up an AGGREGATE formula, and the written instructions are below the video. 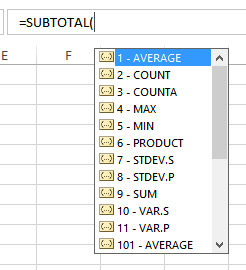 After you filter the rows in a list, you can use the AGGREGATE function, instead of the SUM function, to sum the numbers in the visible rows. 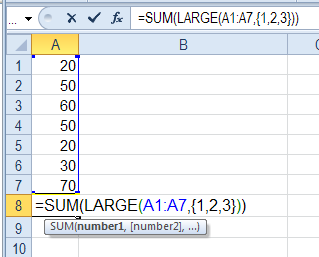 This function was introduced in Excel 2010. Similar to the SUBTOTAL function, AGGREGATE ignores hidden rows, and offers several functions, like SUM or AVERAGE, for the selected data. However, it has 19 functions, compared to SUBTOTAL's 11 functions. Unlike the SUBTOTAL function, AGGREGATE can be set to ignore errors, as well as hidden rows, and nested SUBTOTAL and AGGREGATE functions. In the list of functions, double-click on 9 - SUM, to add 9 as the first argument. Type a comma, and in the list of options, double-click on option 3 or option 7. In this example, 3 is the second argument, and the result will ignore hidden rows, errors, and nested AGGREGATE and SUBTOTAL functions. Type a comma, and select the range of cells that contain the data -- D2:D7 in this example. Type a bracket, to complete the formula, and press the Enter key. Incorporating that technique, SUMPRODUCT can be used to sum visible items in a filtered table. In the following example, column D has been filtered for amounts greater than 100. 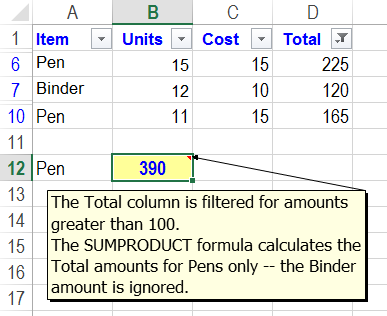 The following formula will sum the Total amounts, in rows that contain "Pen" in column A.
Filter column D for amounts greater than 100. 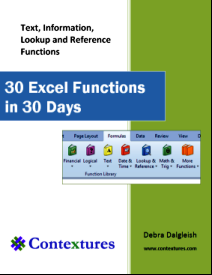 Download the zipped Sum functions sample workbook. The workbook contains the examples for SUM, SUMIF, SUMIFS, SUMPRODUCT, SUBTOTAL and AGGREGATE functions. The zipped file is in xlsx format, and does not contain any macros. Download the 7 Ways to Sum sample workbook, to follow along with the 7 Ways to Sum video. The zipped file is in xlsx format, and does not contain any macros.